there for mold to eat. If you've ever had to kill a weed, you know that simply cutting away the visible portion is not enough. To kill a weed permanently, you have to remove it by the roots— its source of life. Like weeds, mold and fungi cannot be killed simply by wiping the visible portion away. Mold spores are almost always present, just waiting for a chance to grow. The only way to truly control mold growth in a home is to eliminate the bare necessities it needs to live. 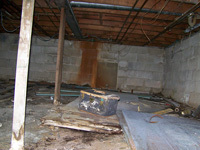 At Silver River Basement Systems, we are experts at creating crawl space environments where mold and rot cannot thrive. We stop the problem by eliminating what helps it grow- specifically moisture and humidity. 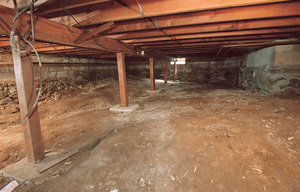 For a free dry crawl space quote, call or e-mail us today! 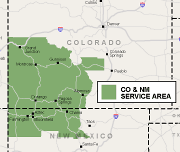 Silver River Basement Systems operates in the Colorado & New Mexico area, including Grand Junction, Durango, Farmington NM, and many areas nearby. Mold is very tolerant to heat and cold— it grows in refrigerators, and it will certainly survive in your crawl space. 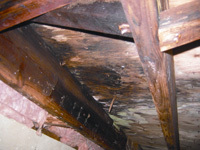 Mold can also survive by eating just about any organic material, including wood, fiberglass resins and paper backings, cardboard, dust, and organic materials in soils. However, mold has one important weakness: it needs lots of humidity to survive. This can be controlled by sealing off the crawl space vents, installing a plastic vapor barrier on the walls and floor, and running a dehumidifier in the space. 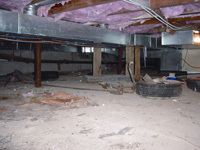 A damp, moldy crawl space with open vents and a dirt floor. 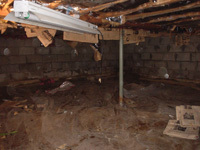 The most common reason for crawl space mold is vented or dirt crawl spaces. Open crawl space vents bring in summer humidity, snow, rain, fog, and other sources of moisture— all of which creates a good habitat for mold. Additionally, winter cold will cool crawl space utilities such as furnaces or water heaters, costing you more on your utility bills. 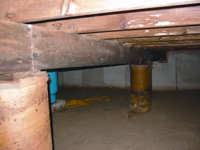 Fortunately, sealing the crawl space to prevent these problems is a simple job— one that can be completed in a day or sometimes less. The vents should be sealed off with airtight covers, and a thick, durable liner can be installed on the walls and floor. Airtight crawl space doors can be installed, and an energy efficient crawl space dehumidifier should be installed to dry out any existing moisture & maintain the space. If you'd like to find out how much installing a system like this in your home would cost, Silver River Basement Systems would be happy to help. 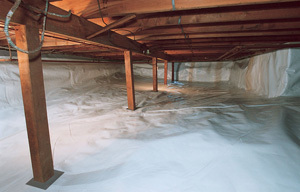 We provide free crawl space sealing estimates to homeowners in our area, including an on-site inspection, personal consultation, and written quotes. Call or e-mail us today to get started! We serve Durango, Grand Junction, Farmington NM. 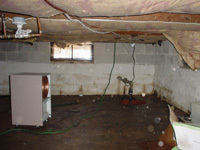 Crawl Space Mold Gallery - Click on any image below to see the full size.